GingerPeach is rockin’ & ROLLIN’! She now has wheels! 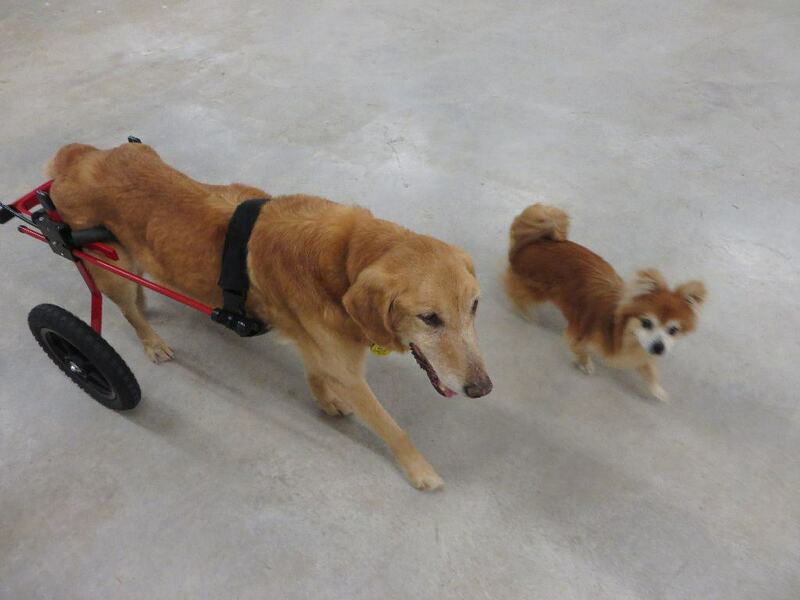 A Rear Support Wheelchair by K9 Carts, the Pet Mobility Experts since 1961. We’ve had it for 13 days now and we love it. 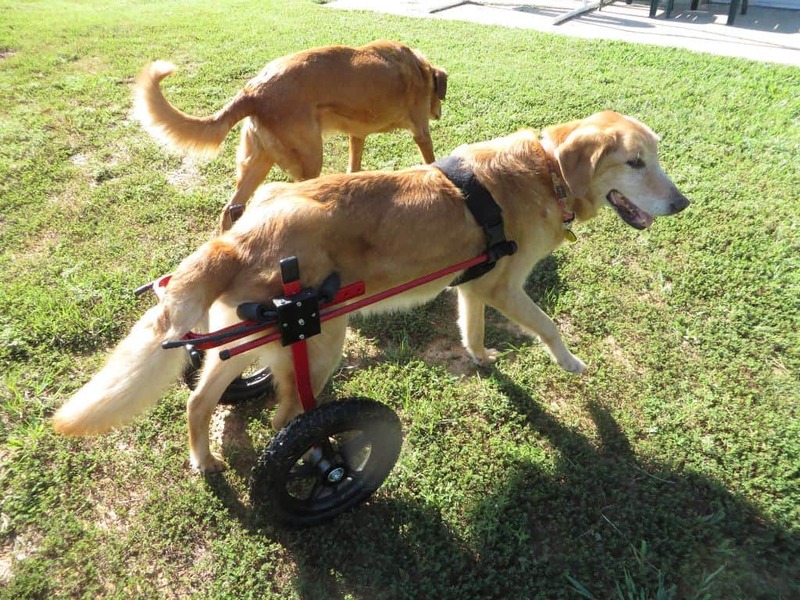 This lightweight, beautiful, superbly-designed wheelchair (“cart”) supports her hind end 100%, which is exactly what she needs. She was exerting far too much energy “dealing” with her very weak and unstable hind end. Just trying to maintain balance while standing was zapping her energy and strength – leaving little energy for walking, exercise, enjoying her life. Without the cart, her hind end often sways when she is standing. Her rear legs often tangle up with one another causing her to fall. Sometimes her rear paws “knuckle under” throwing her off balance and causing her to slip and/or fall. Instability, slipping, falling are not good. Even in the absence of physical injury, psychological injury is present – decreased confidence, insecurity, stress, depression. Though GP is a very resilient, strong and happy Girl (she’s lived with and overcome the difficulties of refractory epilepsy and seizures for 10 years), the decreased mobility is hard on her. GP is vibrant and has great desire to be mobile. It’s clear she wants to be up walking, doing, moving. She tries to get up and is either unable to do so (the bad days), or is able to do so but is soon down again in need of rest (good days). Her mind is willing yet her body is weak. It’s very difficult for to see her struggling. I was concerned about her going on walks and field outings with us. On a few recent occasions (the week I decided to order a cart), I left her inside with a bully stick only to return and find her at the door waiting for us, bully stick untouched. K9 Carts to the rescue. In addition to their excellent wheelchairs, I was intrigued by their rental program and rent-to-own program. No additional fees for renting. I called them to discuss GP and their carts and they were very helpful. After our discussion, I decided I had to at least rent a wheelchair and see if it would help GP. Assembly was a breeze, likewise for the adjustments required for proper fit. Morning of our 2nd day with the cart, I again called K9 Carts, this time for a Consultation on fit. Barbara (the owner) answered and was very knowledgeable. While we were on the phone she reviewed my pics and a video I sent her, and assured me the fit and GP’s movements were correct. GP was able to move and walk in the cart immediately from Day 1, no problem. The cart has excellent action and makes no noise at all. It also turns on a dime. Weighs about 8-9 lbs. What GP’s body and brain have had to learn was to “undo” all the compensating of the past many months. I now realize the use of this cart is a form of Physical Therapy, it causes her to stand in balance and properly use muscles which haven’t been in use for some time. All of this improves her overall strength. Placing her in and out of the cart is also very easy on both of us. In her cart, she has already adjusted her stance and gait. I see improvement in her energy level and endurance. In her cart, she stands in balance. She is now picking up and better using her hind paws and rear legs! Wonderful! To see her confidently standing with a level top-line, stable hind end (no swaying! ), and rear legs properly positioned in a square stance is beautiful. There is a spring and renewed confidence in her step! 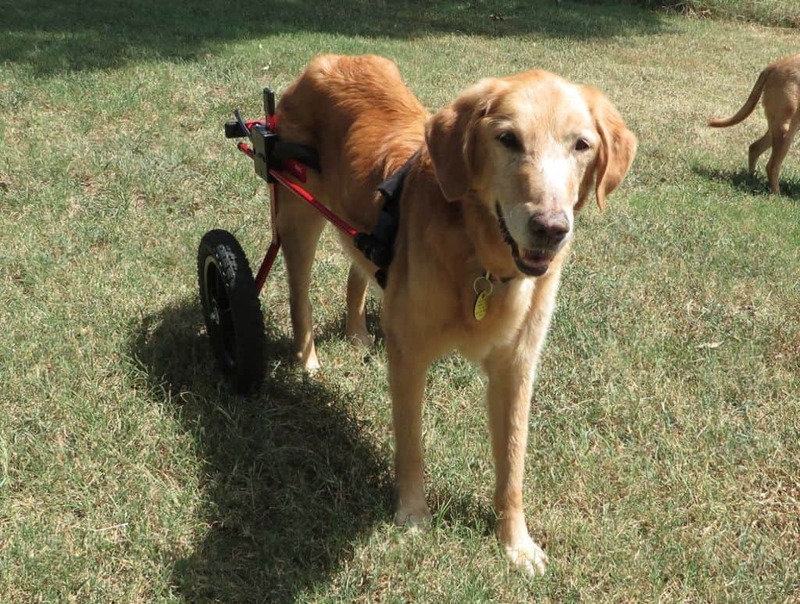 It’s clear to me – and my family and friends who have observed her – she is happy in her cart. We’ll be keeping this cart! 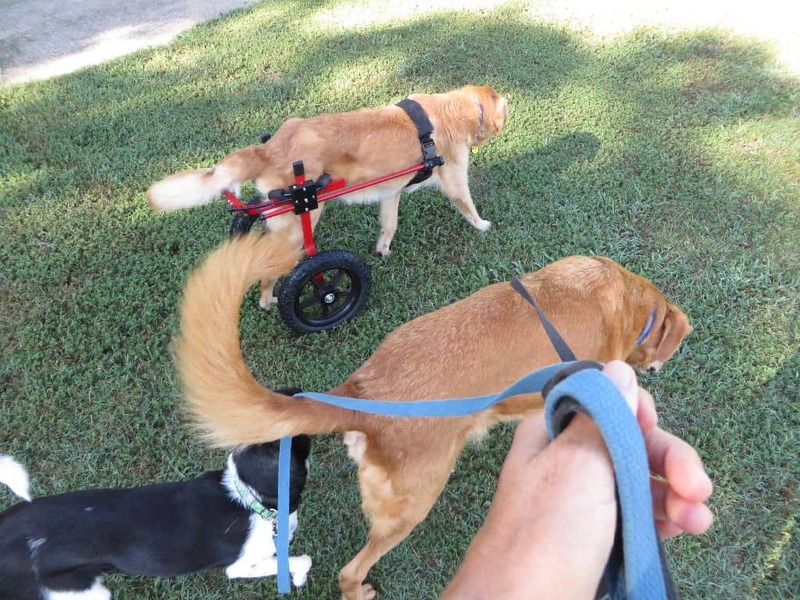 GingerPeach is currently battling other health issues (with help from her wonderful Vet, Dr. PJ Broadfoot) and she still struggles with mobility when not in her cart. At least for now and in her cart, she can still nourish her body and mind with exercise. Her renewed confidence and mobility are of huge therapeutic value. And hopefully with continued use of the cart, her strength out of the cart will improve. Time allowing, I will make a video***. 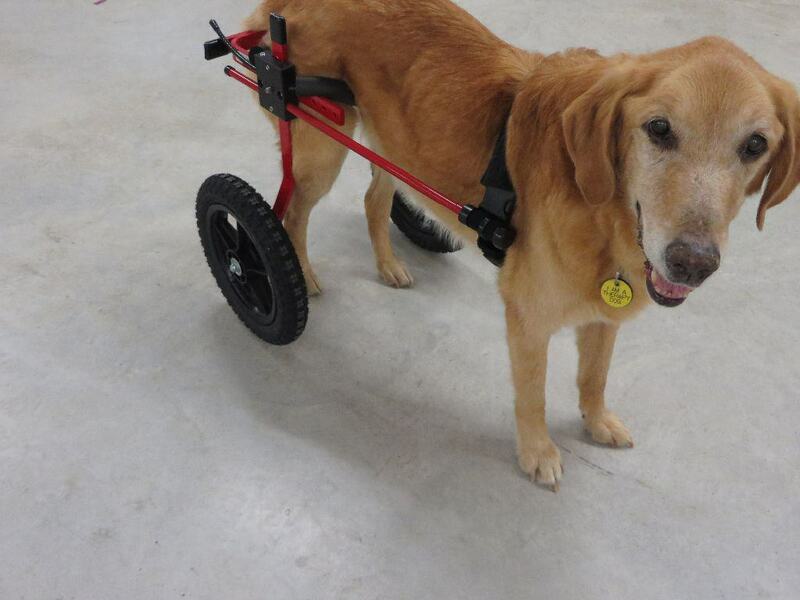 For now, a few pics of an amazing and confident GingerPeach in her gorgeous, fire-engine red Rear Support K9 Cart. If your dog or cat, lamb, rabbit, chicken, iguana (yes! 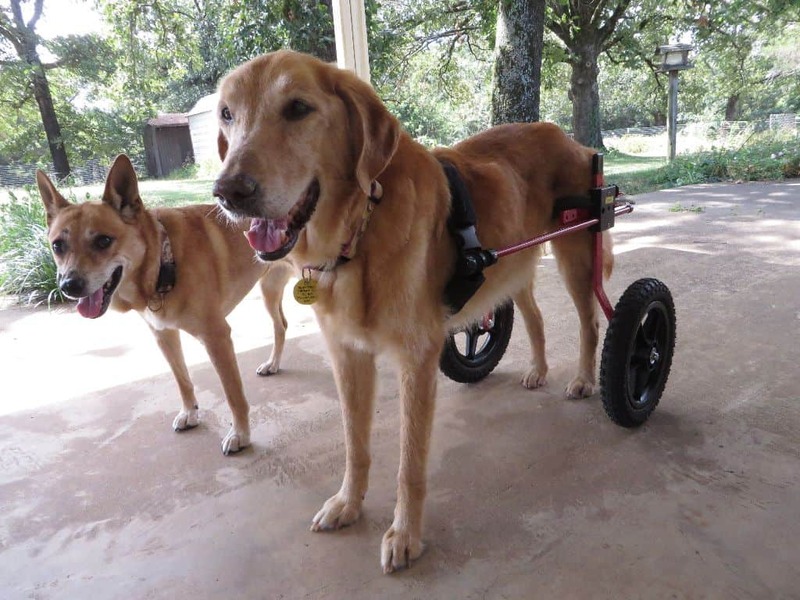 K9 Carts has made carts for all those species) is beginning to struggle with mobility issues, is paralyzed, or recovering from surgery and needs rehab’, visit the K9 Carts website and the K9 Carts facebook page for more details. I am very happy with our cart and so is GingerPeach! GP’s cart easily converts into a Full Support Wheelchair if that becomes a future need. ***Sept 18, update, blog post with video and youtube video playlist have now been created. Day 02, another test drive on back patio & backyard. Piglet unphazed. GP going for the pass! Chibi & the Posse are unphazed by the cart. Watch your tail, Chibi! Day 08, after her 1st Field Outing in her cart. Happy GP!